The floodwaters are rising and the animals need to board the ark! 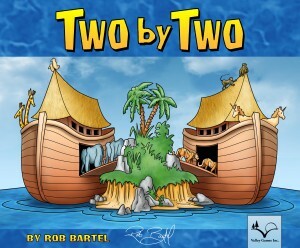 Valley Games is pleased to announce the arrival of Two by Two, and the first published for designer Rob Bartel. Players move their ARKS around a steadily deteriorating landscape, matching pairs to rescue stranded animals. The goal is to find matching pairs of animals and bring them onto your ark before your opponents raise the waters. There are six animals of every type, except for the unicorn, of which there are only two. Animals that are rare at the end of the game are worth more points. The game is for 2-4 players aged 8 and up and takes around 45 minutes to play. This game offers both the family and the seasoned gamer the opportunity to have a great deal of fun.